Summer is on its way, and with it comes spending time enjoying the outdoors with backyard barbecues. If you don't have the perfect outdoor kitchen space set up for barbecue season—but you want one—it's not that hard to set one up for cooking and entertaining. 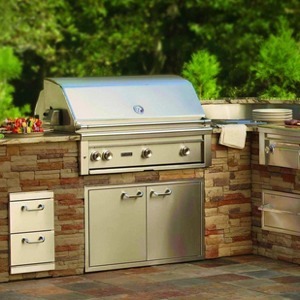 And whether your budget is modest or sky high, we can help you pick out the gear you need for an ideal outdoor kitchen. If you'd like a great outdoor space for entertaining but don't have the budget for fancy high-end appliances, don't worry. You can put together a decent outdoor kitchen without breaking the bank by using what you've already got (and relying on your indoor kitchen for most of the prep work): all you really need is a grill to cook on and a cooler to keep the drinks cold. We assume you already have both, but if you want something a bit fancier than what you have on hand, we have a few recommendations. If your outdoor cooking needs tend more towards stir fry, perhaps an outdoor wok is more your style. 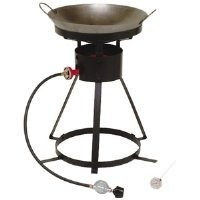 King Kooker offers a 24" portable propane cooker with wok. This can be easily set up outside or taken camping for easy stir fry wherever you are. If you prefer your barbecue smoked rather than grilled, a smoker doesn't have to be an expensive or elaborate addition to your outdoor cooking arsenal. The Weber Smokey Mountain Cooker Smoker is small enough that it won't overwhelm your back yard, but with 481 square inches of cooking space, it's no slouch. It's a pricer addition to your cooking collection, but as long as you make use of it, it will pay for itself in delicious barbecue. For keeping things cool in the summer heat, any kind of cooler will do. But if you want something that doesn't look like it's spent many a summer being hauled around to picnics and other outdoor outings, you should look at the Suncast Resin Wicker Cooler. Not only will it stand up to being left outdoors all the time, it will also blend in seamlessly with the rest of your patio furniture. If you really love your summer barbecues and are prepared to spend good money to make the perfect outdoor cooking space, there are plenty of great—though pricey—options to make the outdoor kitchen of your dreams. The best outdoor kitchens have custom countertops designed to put up with the weather and feature with built-in appliances. For a high-end grill that will fit right in to your counter, it's hard to do better than this Lynx 36" Built-In Natural Gas Grill. Running on natural gas means the Lynx is simple to operate—no more complicated than turning on your stove—and yet its 640 square inches of grilling space makes this grill a barbecuer's paradise. 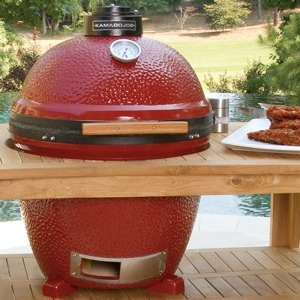 It also has a smoker box for giving your food a nice, smokey flavor and a rotisserie. If you're looking for a less traditional barbecue grill, look no further than the versatile Kamado Joe. These egg-shaped ceramic grills will grill or smoke your food, and the ceramic body holds in heat while its unique circular shape helps circulate heat for even cooking. Add it up, and the Kamado Joe spells yummy barbecue. Units can be freestanding or built into a countertop if you prefer, and come in a variety of colors. We like this 23" model in red. 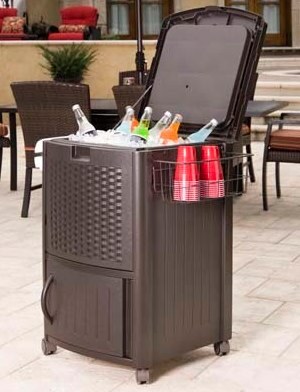 Though any cooler will do, a mini-fridge will keep food and drinks cold without all the bother of melted ice. 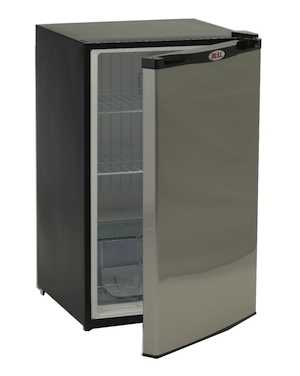 But if you're going to keep a refrigerator outdoors, you'll want one designed to deal with the elements, like this Bull Outdoor Products Stainless Steel Refrigerator. If you want a full outdoor bar setup, you could put together a custom bar by collecting all of the different pieces you'd like and building a cabinet around them. But you could also save yourself some trouble and pick up this stainless steel bar from Bull that has all the components you need in a single unit. 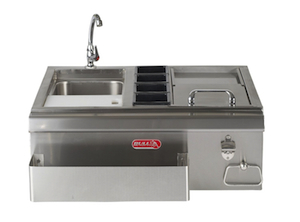 It includes a sink, an ice chest, condiment caddies, and a cutting board—though you'll still need a counter to put it in. And now: bring on the summer barbecues! 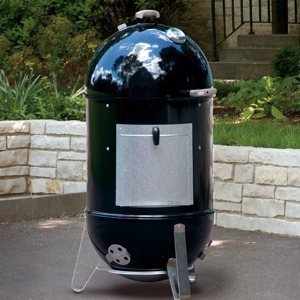 Really, do a little research, the Big Green Egg is the Kamado grill of choice for discerning smokers/grillers; checkout Wikipedia and see what Kamado style grill they reference…BGE! !